Here is a great sized lot in an area rich with wildlife and recreation possibilities! This parcel has 280.3 feet of road frontage on Collins Lake Road and is conveniently located in the southeast region of New Brunswick, just minutes away from the coastline, beaches and coastal communities. Electricity and phone service at roadside. Sorry this property is SOLD. Location: Shemogue, New Brunswick, CANADA. Overhead view of your land. Another overhead view of your land looking in a southerly direction down Collins Lake Road. Looking into your land from Collins Lake Road. Looking along the northerly property line from Collins Lake Road. Your land on right and Collins Lake Road in a northerly direction towards HWY 15. A neighbor about 1/2 mile up the road along Collins Lake Road. Collins Lake to the south of your land. Looking down Collins Lake Road from HWY 15 at Shemogue. Your land is a mile away from this point. 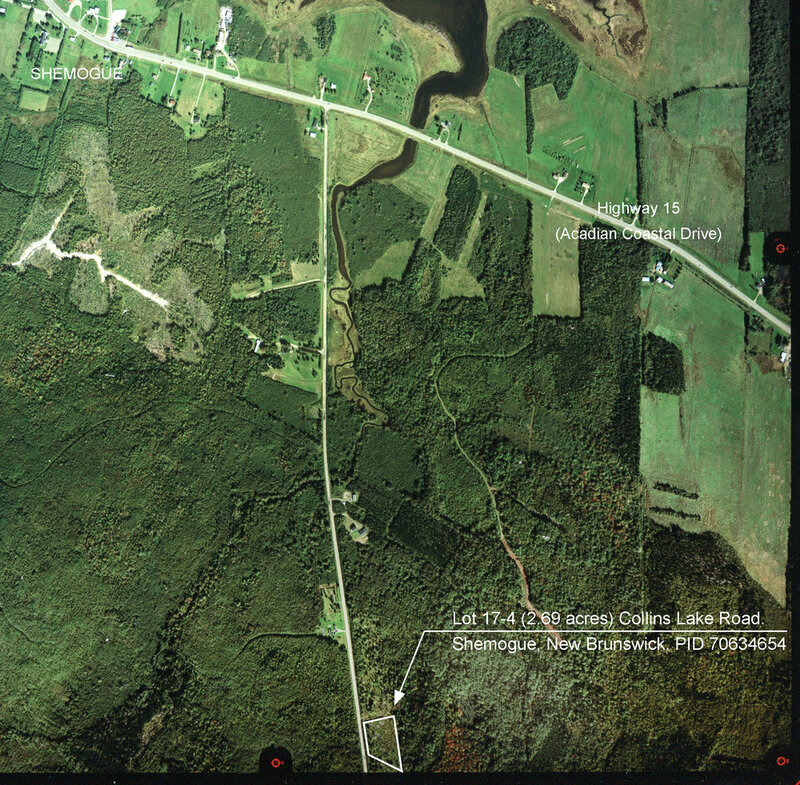 Air photo outlining your land on Collins Lake Road in Shemogue. 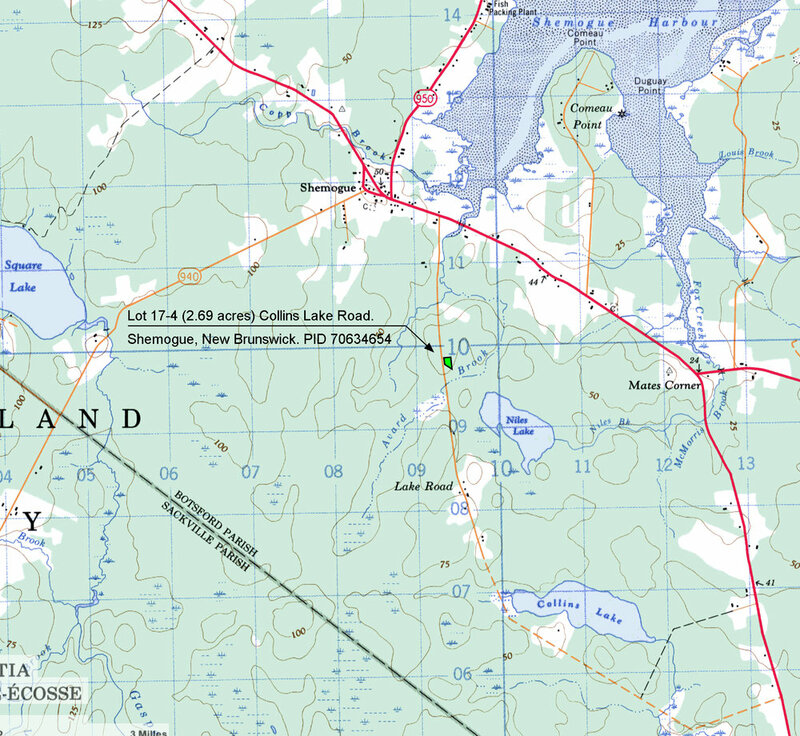 Topographic map showing the location of the property in Shemogue, New Brunswick. The ground is high and dry. - Close to Collins Lake and Niles Lake. - Electricity and telephone at roadside. - Just over a kilometer from Highway 15 (Acadian Coastal Drive). - Close to communities and services - Cap Pele, Port Elgin, Shediac. - About 40 minutes from the City of Moncton and Moncton International Airport. - An excellent parcel for a land investment in Canada or as a future building and recreation site. 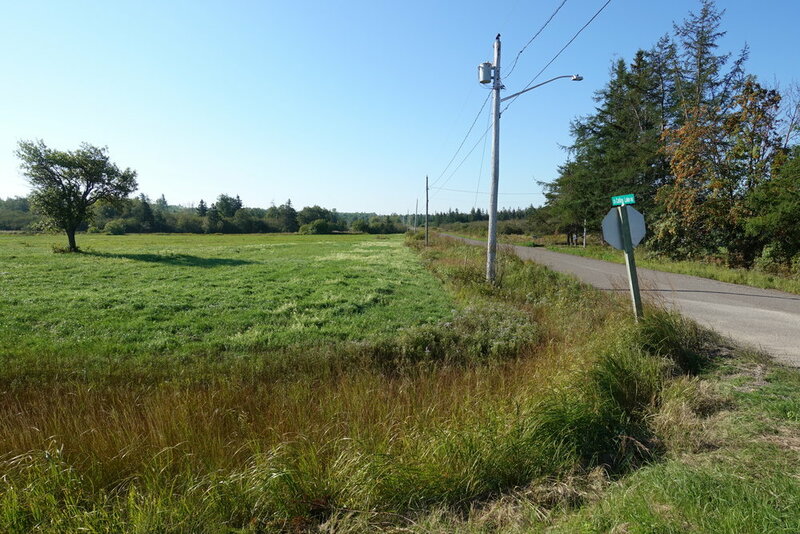 This is a fantastic and affordable 2.69 acre surveyed lot located in southeast New Brunswick. The land is just minutes from several seaside communities including Cape Pele, Port Elgin, Shediac and is close to the Confederation Bridge to Prince Edward Island. This property is roughly rectangular in shape, measuring 280 feet wide on the eastern side if Collins Lake Road. Northerly, Easterly and Southerly boundaries measure 293 feet, 520 feet and 377 feet respectively. The land is more or less level throughout and sits approximately 30 feet above sea level. The land is dry and well draining. The land is treed throughout with well spaced mixed growth of Maple Trees with a few Evergreen Fir Trees at front and some large mature trees towards the back line as you approach the neighboring acreage to the east. All you need is a culvert and driveway entrance onto the land and it is ready for you to use and enjoy. You may build on the land though there are no requirements, nor timelines to do so. This is a very peaceful setting on Collins Lake Road, a paved and gravel surface road which runs south from New Brunswick Route 15 at Shemogue, around Niles Lake, a number of residential homes, then southeast around Collins Lake before connecting again to Route 15 at some picturesque open fields at Woodside. The stretch of road that borders your land is chip-sealed (paved), maintained and plowed for snow in winter months. The Gaspereau River, South of your land along Collins Lake Road is a large tidal river, great for canoeing and kayaking and nature sightseeing. The Gaspereau flows south from this area through Port Elgin to the ocean, just 4.5 miles away. This region harbors abundant stock of wildlife ranging from moose, white-tailed deer to rabbit, fox, grouse, and other small game birds. Ocean fishing and lake fishing are not far away! Niles Lake and Collins Lake are within a few miles of the land. 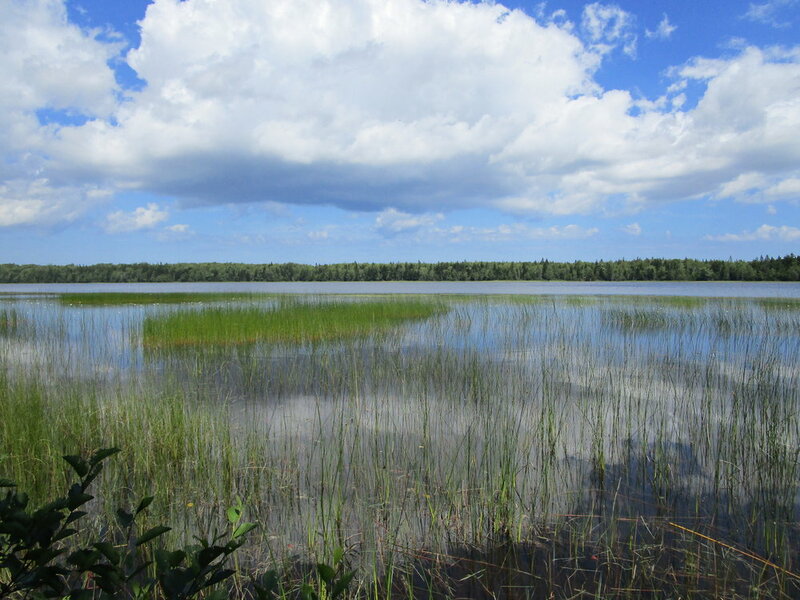 These are good sized lakes where you’ll likely land Trout. 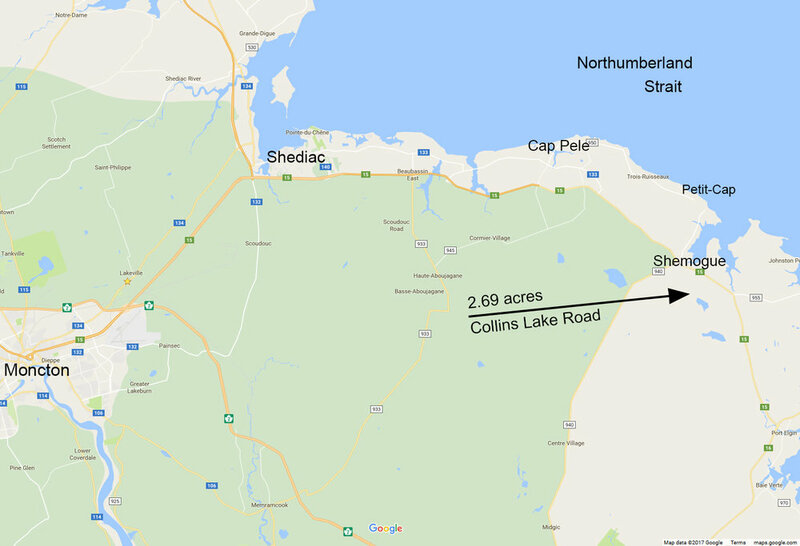 Just North of your land near the intersection of Collins Lake Road and Highway 15 we own a 1.5+/- acre plot that touches Shemogue Harbour, which we are including the use of to access the water. Here you can launch a canoe and kayak and paddle around the harbour and even out to the Northumberland Strait (Gulf of Saint Lawrence). If you have a larger boat or sail boat, moorage can be arranged in nearby Cap Pele and Shediac and Port Elgin. This property is conveniently located just 10 minutes north of the village of Port Elgin, 5 minutes south of the many communities, villages and beaches along the Northumberland Strait, and 30 minutes from Sackville, a beautiful University town known for its large bird and waterfowl park and marshlands park. 35 minute drive via Highway 15, is Moncton - New Brunswick’s second largest city with an international airport. To get to your property from Moncton take highway #15 northeast to Shediac (lobster capital of the world and home of Parlee Beach), continue east on #15 to Shemogue, approximately 36 kilometres (20 miles) away. From Shemogue travel south on Collins Lake Road for 1.4 kilometers to your land on the left. The boundary lines were recently surveyed and Lot signage will be posted shortly. Sorry, this lot is SOLD. To view more properties similar to this, visit our New Brunswick property list, here.